Pelargonium crassicaule is a succulent plant with dainty, fragile, faintly sweet-scented flowers varying considerably in colour, and has great potential for cultivation. 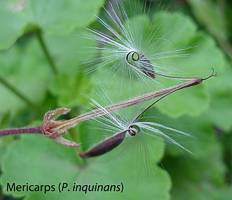 Pelargonium crassicaule is a small, succulent plant with short, thick, dark brown stems, usually not more than 200 mm high. Semi-persistent stipules are present at the tips of the branches and the swollen base of the stem is shiny. Leaves are deciduous; simple, broadly ovate, with conspicuous silver, silky hairs and a wedge-shaped base; margins are bluntly dentate and wavy; veins are prominent on the lower surface, densely covered with whitish hairs. Flowers are borne in a cluster of 5-9 per umbel. The corolla is usually white with or without wine-red to purple markings, but can also be pale yellow, pink or lilac or combinations thereof. The colour may even vary dramatically within the same population. Plants flower from June to October, with a peak in the warmer spring months, August and September. The fruit splits into separate parts (mericarps), with the basal part about 6 mm long and a tail of about 35 mm long. In Namibia this species is listed as Near Threatened (Mannheimer et al. 2008) and in South Africa of Least Concern (Raimondo et al. in prep.). In recent times, numerous populations have been plundered to obtain material for commercial use-probably due to the literature stating its potential for cultivation. The distribution of Pelargonium crassicaule is limited to a narrow of land about 300 km along the coast, extending from Namibia (Lüderitz) in the north to South Africa, just south of the Orange River. Plants grow between crevices in rocky outcrops of quartz, granite-gneiss, schist or sandstone, in direct sunlight. The genus name Pelargonium is derived from the Greek word, pelargos (stork), referring to the fruit looking like the head and beak of a stork. The epithet crassicaule is derived from the Latin word, crassus (thick), and the Greek word, caulos (stem), which refer to the thickness of the stems of P. crassicaule. 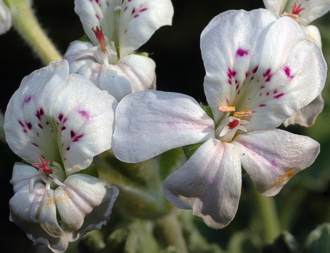 The greatest number of the 270 species of Pelargonium occur in southern Africa. The flowers are irregular, with five petals and ten stamens, usually 2-7 of the stamens are fertile. Pelargonium crassicaule was first discovered by Hove, a horticulturist, during his pioneering plant collecting activities along the Namibian coast in 1786. Plants were sent to the Royal Botanical Gardens at Kew, and presumably L'Héritier used this material for his original description in Aiton's Hortus Kewensis, published in 1789. It closely resembles P. cortusifolium, but is distinguished by its tapering leaf base as opposed to the heart-shaped leaf base of the latter. Growing in a habitat that receives less than 100 mm of rain per annum (mainly in winter) Pelargonium crassicaule is exposed to mist rolling in from the sea throughout the year. Winters are frost-free and summers are temperate due to the cold Benguela current along the coast. Wind is another difficulty for these plants growing in an extremely hostile environment. Adapted to the hostile desert environment, Pelargonium crassicaule sheds its leaves (deciduous) in the hot summer months and the stems assume a knobbly appearance in order to reduce water loss through transpiration. In summer, when the plant is dormant, the stem is protected against the sun by the brown shiny, rather woody stem. Leaves develop soon after good rains, and are crowded at the tips of the short branches. In peak flowering time, plants are floriferous and seed production is usually very high. Seeds germinate easily and the high production rate is probably due to the high mortality rate of seedlings in their hostile environment. Pelargoniums, in general, are of economic importance in horticulture as garden or greenhouse ornamentals and as sources of essential oils. In general the genus is much used in a variety of medicinal applications, but, as far as could be established, this species is not mentioned anywhere specifically. Pelargonium crassicaule has horticultural potential. It is ideal as a container plant or to grow as a bonsai subject with its short, thick, perennial stem. This species is recommended for cultivation. Cuttings root easily in a well-drained sandy medium. Seed set is profuse, and the seeds germinate freely wherever they fall. Plants should be sheltered against excessive and prolonged rain, although careful and frugal watering throughout the year results in fine, leafy specimens. Pelargonium crassicaule requires long hours of direct sunlight. Freezing temperatures should be avoided. Plants can be easily propagated by both seed and cuttings. Sow healthy fresh seeds in a damp potting soil mixture, kept between 15-21°C to prevent a damping-off effect. The best time to take cuttings is spring or autumn - try to use a vigorously growing stem to make your cutting. Use a sharp, sterile knife and cut the stem just below a node, about 77 mm long. Place the cutting upright in a good compost mixture with added sand to aid in the drainage of the mixture. 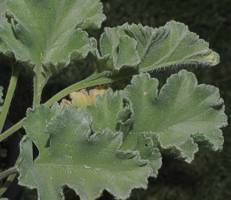 Succulent pelargoniums are vulnerable to eelworm attacks. Grow marigolds or khaki bush ( Tagetes minuta, a naturalized species) in close proximity to the plants that need protection. Dig these protective plants into the soil before they seed - the strong scent apparently drives the eelworms away. Dreyer, L.L. & Makwarela, A.M. 2000. Geraniaceae. In O.A. Leistner, Seeds plants of southern Africa: families and genera. Strelitzia 10. National Botanical Institute, Pretoria. Gunn, M. & Codd, L.E. 1981. Botanical exploration of southern Africa. Balkema, Cape Town. L'Héritier de Brutelle, C.-L. 1789. Pelargonium crassicaule. In F.W. Aiton, Hortus Kewensis, edn 1. London. Mannheimer, C., Maggs-Kölling, G., Kolberg, H. & Rügheimer, S. 2008. Wildflowers of the southern Namib. Macmillan, Windhoek, Namibia. Oliver, I.B. 1998. Grow succulents. Kirstenbosch Gardening Series. National Botanical Institute, Cape Town. Pole Evans, I.B. 1922. Pelargonium crassicaule. The Flowering Plants of South Africa 2: t. 52. Raimondo, D., Von Staden, L., Foden, W., Victor, J.E., Helme, N.A., Turner, R.C., Kamundi, D.A. & Manyama, P.A. (eds). In prep. Red List of South African plants. Strelitzia. Van der Walt, J.J.A. & Vorster, P.J. 1981. Pelargoniums of southern Africa, vol. 2. Juta, Cape Town. Watt, J.M. & Breyer-Brandwijk, M.G. 1962. Medicinal and poisonous plants of southern and eastern Africa. Livingstone, Edinburgh and London. Webb, W.J. 1984. The Pelargonium family. Croom Helm, London and Sydney.